The City Palace is a historic landmark in the pink city, Jaipur. 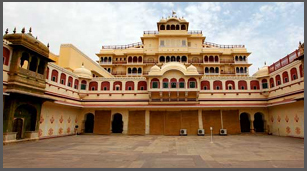 The City Palace complex is the place where the royal family of Jaipur used to stay. Displaying some extraordinary work of art, the City Palace is a perfect amalgam of Mughal and Rajput architecture. The palace complex was built by Maharaja Jai Singh II of the Kacchawaha clan of Rajput and his successors made several noteworthy additions to the complex in the later years. The City Palace Complex has been divided into courtyards, beautiful gardens and buildings. Some of the beautiful buildings in the City Palace complex include Mubarak Mahal, Badal Mahal, Sh. Govind Dev Temple, Chandra Mahal and City Palace Museum. Two elephants carved in marble, guard the entrance of this important landmark in the Pink City. The City Palace also houses a museum that showcases the grand collection of 2000 weapons that date back to 1580. It has a good collection of various types of Rajasthani dresses a fascinating armoury of Mughal and Rajput weapons. City Palace :This massive structure contains numerous interesting palaces and building of tourist's interest. City Palace - JaipurIn the heart of the old city of Jaipur, the City Palace holds a large area, divided into a series of courtyards, gardens, and buildings. The Jantar Mantar is a sophisticated collection of early 18th century structures designed to measure the movements of the stars, sun and planets. Designed by Maharaja Sawai Jai Singh himself, each instrument of Jantar Mantar has a specific astronomical task to perform.